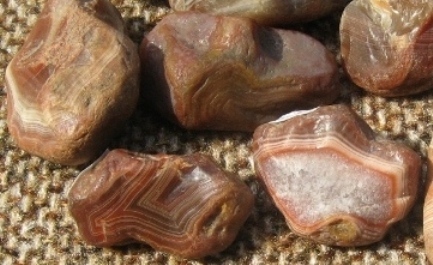 Agate is a microcrystalline kind of quartz, with fine grains. Mainly it's chalcedony, and while agate is associated with volcanic rock, it may be encountered in various rock. The pretty agate to the left is a Laguna Agate from Mexico, with a crystal pocket and sagenite. It's said that the Greek naturalist and philosopher, Theophrastus, discovered agate along a river in Sicily, known in ancient times as the Achates, (Gr. Άχάτης)* and gave it its name. 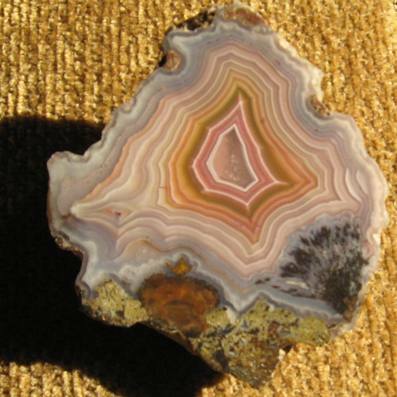 Pliny said that the agate was first found in Sicily "on the banks of a river of the same name." A Latin-English dictionary lists achates, ae as the word for agate. Another source says the Latin word Achātes is from the Greek Akhātēs (The Greek letter chi, χ, can be rendered as a "k." In Classic Greek it's close to the "kh" in inkhorn). (With a little imagination, you might think "a river" is running through the above agate, at the right.) Today the aforementioned river in Sicily is known as the Drillo (or the Acate), which rises the mountains in southeastern part of the island and flows 34 miles to the sea. The Drillo and other rivers originate on the slopes of Mt. Lauro and volcanic rocks are found in the area. Along with other mountains, Mt. Lauro is part of an inactive underwater volcanic fissure. Agates are found in holes in lava and this may be why they were found in this river. 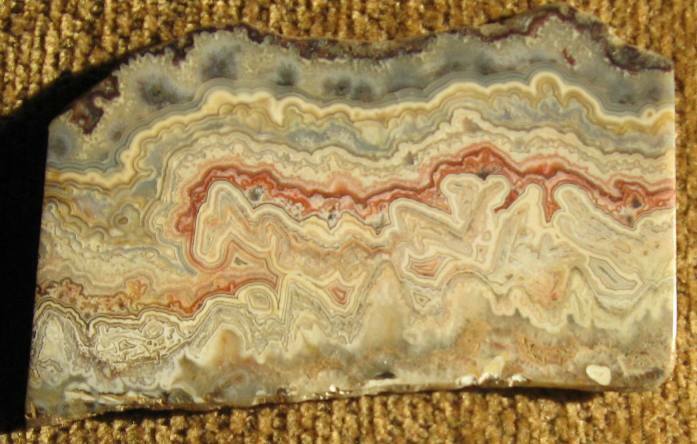 Below is a sliced piece of CRAZY LACE AGATE. It's interesting to see its formations, some suggesting people. If you search around the rock, there happens to be a tiny formation like the capital J letter, with a shortened loop. Once while traveling through Mexico, I found such agate in area of high ground, off of the road. Agates are also found as pebbles or small rocks; some of those that appear in the picture here, appear to have come from the way they existed in nature. But the others were polished, with one of them being sliced. Its bands look like the crest of a bird. Although one of them is more gray, they all exhibit a reddish color. The agate (lower left of photo) may be one that was found years ago in a field of the farm where I grew up in Sac County, Iowa. This field lay across the creek from where our home stood. It was on higher ground than the Indian Creek which wound through the length of our farm. According to an old geology map, this stream generally formed the boundary between two glacial drifts, known as the Kansan and the Wisconsin. If for our land, the Iowa Geological Survey map hasn't been revised from the time it was printed in 1905, it shows that the field belonged to the superficial deposits of the Wisconsin glaciation period. Large deposits of gravel were found and worked near this creek, even some lesser pits on our farm. 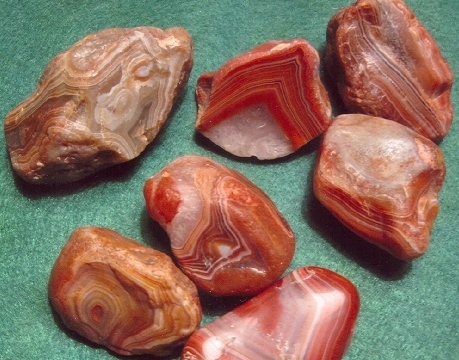 An article on the Minnesota Department of Natural Resources website, says, the Lake Superior agate is different from other agates of the world in its "rich red, orange and yellow coloring." It says these colors come from iron which oxidizes, and leaches from rocks, providing the pigment for the "beautiful array of color. 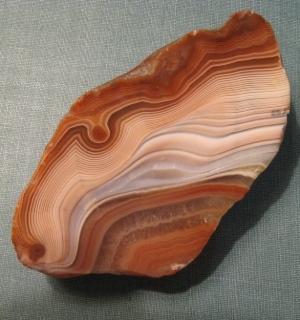 The concentration of iron and the amount of oxidation determine the color within or between an agate's bands." The Mesabi and several other iron ranges lie in counties of Minnesota, to the north, and around to the west of Lake Superior. The Minnesota DNR says that over a billion years ago the continent of North America started to split in two. Molten rock moved within the earth, deep down, and poured forth in lava flows rich in iron, now exposed along the shores of Lake Superior. These forces that were pulling North America apart, left the flows of lava and created a trough, which would become the Lake Superior basin. The lava that issued forth has been called "the birthplace of Lake Superior agates." CO2 and water vapor were trapped in millions of bubbles (gas pockets called vesicles), in the flows that solidified, and later on, groundwater carried dissolved minerals like ferric iron and quartz through the pockets where the gas was trapped. The solutions crystallized into fine-grained bands of quartz called chalcedony. These quartz-filled pockets or vesicles, now agates, were loosed from the lava that held them, by the break-up rock that underwent disintegration and by moving water. The agates were harder than the rock surrounding them. Still most of the agates remained lodged in the lava rock. Then the climate grew colder and the Great Ice Age began. Glacial ice, called the Superior lobe, followed the Superior trough filled with agates, picking up the surface ones, transporting them. The glacier's crushing action and the freezing and thawing at the bottom of it, freed more agates from the lava, carrying them along. It fractured, abraded and rough-polished the agates. The Superior lobe of ice spread agates across northeastern and central Minnesota and into northwestern Wisconsin. The Lake Superior agates, at the left, were found farther south at La Grange, Missouri, which is located on the banks of the Mississippi River, 20 some miles south of Keokuk, Iowa, and just north of the 40th latitude. Lake Superior is above the 46th.